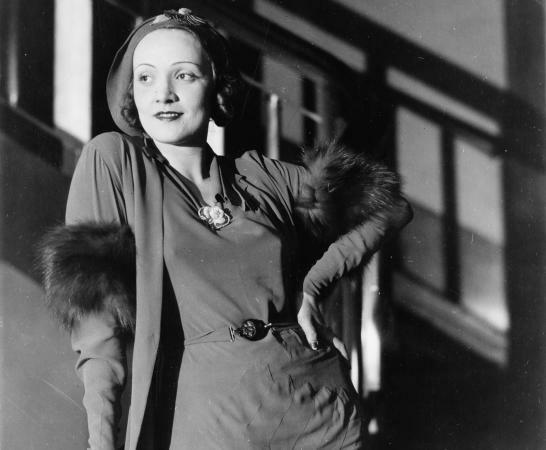 Marlene Dietrich was an iconic trendsetter. Functionally, clothes provide warmth and protection. Socially, clothes express status and identity. The first trendsetters were members of the ruling class, particularly monarchs and aristocrats. Queen Elizabeth I, for example, adorned herself as if her person were the state, creating an unassailable image for herself as Britain's monarch. Similarly, Louis XIV of France dressed to impress, and also set rules regulating what members of the court aristocracy were to wear. By the eighteenth century, however, trends were increasingly set by individuals in urban centers, such as Paris and London, rather than at court. In the mid-nineteenth century, the wife of Napoleon III, working with the couturier Charles Frederick Worth, set fashions for an eclectic array of nouveaux riches, social climbers, old aristocrats, and members of the demimonde. Women of the demimonde were often entertainers, actresses, and dancers, as well as courtesans. In some ways, they were precursors of modern stars. By the beginning of the twentieth century, theatrical stars such as Sarah Bernhardt were joined by film stars such as Clara Bow, Marlene Dietrich, and Greta Garbo in setting sartorial trends. For example, the ballroom dancer Irene Castle helped to popularize the post-World War I trend for short hair when she cut her own hair in a "Castle bob." By the early 2000s, actresses remained among the most important trendsetters, joined by pop singers such as Madonna, arguably the most trendsetting woman of the twentieth century. Fashion magazines-notably Vogue-have also played an important part in launching "the Beautiful People" as celebrity trendsetters. Among them were girls of good family, dressed and posed and photographed by fashion editors and photographers. The 1957 film Funny Face starred the gamine Audrey Hepburn, whose character lived out the transformation from duckling to swan. What is a trendsetter? A woman put on a pedestal, an icon that others want to follow. In magazines, they fall into a few categories: the society girl (Gloria Guinness, sometimes known as "the swan," and Babe Paley); the model girl (Jean Shrimpton, Veruschka, Kate Moss); the entertainer (Katharine Hepburn, Sarah Jessica Parker). Gabrielle (Coco) Chanel is a rare case of the designer as trendsetter, since she was the best model of her own clothes. The qualities these women possess include beauty, status, and larger-than-life personas. In the late twentieth century, models gave way to the phenomenon of super-models, who commodified trendiness through brand association. Actresses also became associated with particular styles and designers. Trendsetters have become figures thrown into the light by the flare of the paparazzo's flash. Whereas yesterday's social elite had money and status, and actresses and models had beauty, contemporary trendsetters possess a lifestyle (encompassing fashion) that whets the appetite of a global public. See also Actors and Actresses, Impact on Fashion; Celebrities; Supermodels. Howell, Georgina. Vogue Women. New York and London: Pavilion Books Ltd., 2000. Keenan, Brigid. The Women We Wanted to Look Like. New York: St. Martin's Press, 1978. Shakar, Alex. The Savage Girl. New York: Harper Collins, 2001.